In December 1851 there were only 29 people in prison in Victoria. Two years later there were 955. 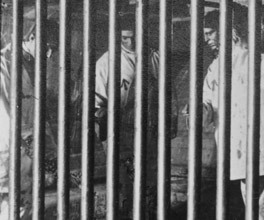 The Victorian gold rush lured to Victoria ex-convicts and escapees – from New South Wales and Van Diemen's Land – who re-offended and were sent to prison. The prisons soon became overcrowded, so the Victorian government decided to use prison hulks. In 1852 it purchased the ship President and had it fitted out as a floating prison. But the prison population continued to rise, so the following year the government purchased the Deborah, Success and Sacramento for conversion into prison ships, followed by the Lysander in 1854. The ships had their masts removed and were anchored off Williamstown on Hobson's Bay. They held the worst offenders in the penal system. The hulks were intended to be a ‘terror to evil-doers', so conditions were extremely harsh. Prisoners were kept in irons below decks, in cramped conditions with no work and no books. For minor offences they were sent to solitary confinement in dark cells below the waterline. In 1853, John Price was appointed as the Inspector General of Penal Establishments. The Age described him as ‘a man whose leading characteristics appear to be cunning and cruelty. Lynn, P & Armstrong, G 1996, From Pentonville to Pentridge, State Library of Victoria, Melbourne, Vic. The idea that the prisoner 'richly deserved' to be punished is John Price's opinion - not a statement of fact. Strong, emotive language is often a marker of bias or subjectivity. In March 1857, Price went to Williamstown to hear the grievances of the prisoners on the hulks. One prisoner threw clods of earth at him, others threw heavy stones. He was then kicked, beaten and struck with picks and shovels. He died the following day.